Okay so I tried to get rid of the emulsion on one screen this morning. I tried using bleach - poured it on one area and let it sit for a while then I brushed it under running water. The emulsion did come off after long strenuous brushing. No good. It will take an hour's work before I can get all the emulsion off. Replacing the entire screen is much easier. I tried vinegar too (read about it in the forums). Nothing happened. So at noon I headed for the TULCO store at QC. I had to commute this time because my big bike is under repairs (had a motorcycle accident 2 weeks ago, caused a big dent on the gas tank). Took a bus to Quirino Avenue, LRT to Doroteo Jose Station, then LRT2 to V. Mapa Station. That was actually my first time to ride LRT2. The TULCO Store is just infront of SM Sta. Mesa along Aurora Blvd. And there was Bicky again. 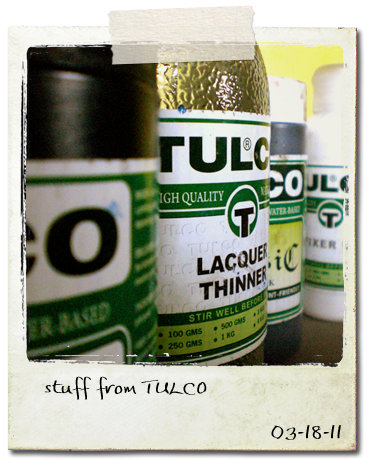 She recommended to me the Tulco Aquasol ER emulsion which is pre-mixed with sensitizer, faster curing time, has a 2 year shelf life and can be stored at room temperature. I bought two 1/4 kilo containers at P170 each. I asked her if they have any reclaiming chemical and she said that I just use their lacquer thinner. So I bought two 350 ml bottles at Php 60 each. To remove the emulsion, she said, I would put thinner on two pieces of cloth then rub both sides of the screen at the same time in small alternating circular motion. I also learned from her that they have a dealer of their products in Binondo, Manila, which is closer from my city. The store name is KIMCO and she gave me the contact numbers. I went home taking another route - jeepney from Aurora Blvd to EDSA. Then took a bus going straight to Alabang, which was a wrong decision. I should have taken the MRT in EDSA because buses wait at the stops in Ortigas and Ayala. So that was a 3-hour ride going home. Back at home I applied the new emulsion on my 4th screen before I went to bed. It was a tiring but an adventurous day.